When DOT installed four pedestrian plazas and a protected bike lane along the median of Pike and Allen Streets in 2009, the results were impressive. Traffic injuries dropped 40 percent at the pedestrian malls; at the intersection of Allen and Delancey, injuries dropped 57 percent. As impressive as those results are, the Pike and Allen improvements were made using low-cost materials, not construction techniques built to last. The plan now is to replace the temporary redesign with more robust permanent features. Construction has started on the final design at the southernmost end of the corridor, between South Street and Madison Street. With additional funding, the redesign could extend one block further north to Henry Street by the time this round of building is complete in November. Another section of the malls, from Grand to Delancey, is scheduled for capital construction beginning this June. The finished treatment, which will feature more landscaping and higher-quality materials for both pedestrians and cyclists, will bring Allen and Pike Streets closer to the vision for the neighborhood developed over several years by local residents, United Neighbors to Revitalize Allen and Pike, and the Hester Street Collaborative. 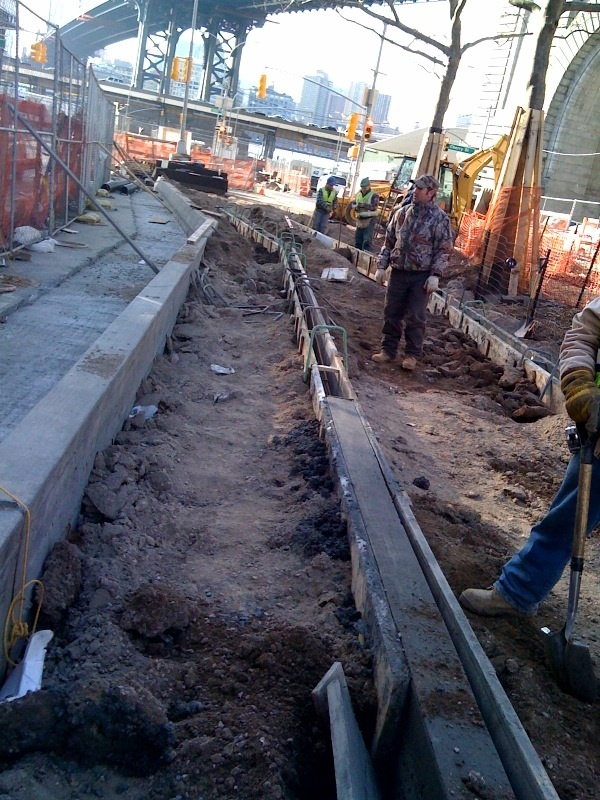 Construction underway on the Pike Street redesign. Photo: Department of Parks and Recreation. Man, not one, but two Chinatown buses in this image, PLUS a little ‘bike wrong way’ sign? Rendering of the week award! I believe this is the first example of a permanently constructed, protected bike lane in Manhattan. The first in the city was Sands St in Brooklyn. This is very important as it consolidates gains and prevents opponents from ripping out this project, if political winds change. Honestly, though, this project was pretty uncontroversial. 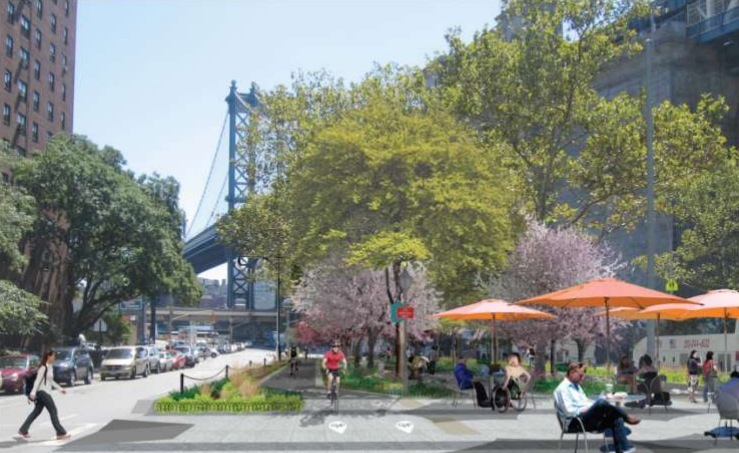 I can wait to use it when it’s complete, as it provides a vital connection between the Manhattan Bridge, the 1st/2nd Ave Bikeways, and the East River Greenway, which is being rapidly improved in lower Manhattan. In related news, the bikeway through Peter Minuit Plaza is now open, even though it doesn’t really connect to anything at present. Agreed with J’s comments except that the bicycle facility depicted in the above image screams bike/pedestrian conflicts. The bicycle facility appears to be one that starts to become unsafe at speeds above 12mph and I can also see peds walking in the cycletrack. I greatly support NYC in its efforts to make the city more bike friendly as their efforts have been a great boost to promoting bicycle facilities in the entire Northeast and in the nation as a whole. However, it’s VERY important to get the details just right. I don’t think its wise to simply replicate the relatively slow speed facilities commonly found in Europe where the safety starts to breakdown at speeds above 12 mph. Many cyclists who ride for transportation purposes on the streets today in NYC and elsewhere in the US are not like the European casual cyclist. As such I don’t think its appropriate to build facilities that are below their speed abilities. On average I think that bikeway facilities should be built to maintain safe operation up to speeds of 20mph, more for downhill situation, less on uphills, occasional exceptions like in areas that are not intended to facilitate longer distance through cyclists, etc. I understand that it’s very difficult to make facilities that are desirable for the risk-adverse cyclists but maintains its safety at higher speeds. In many places NYC has done a good job of getting this right. However it is critical to get this detail right on every project moving forward otherwise I fear there is a real risk of alienating many current cyclists from some facilities and forcing them (in their opinions) to use the road with cars instead. I know that the good folks at NYCDoT and elsewhere in city government are up to that challenge. In my professional opinion don’t think there is really any other choice. Actually the existing Allen St. bike lane has far fewer bike/ped or other conflicts because the bikeway is far from activity at the traditional curbside. It’s one of the best bike lanes in NYC as a result. I think it actually looks to be designed to specifically account for bike-ped conflicts. Peds are given a place to wait at the corner by shifting the bike lane slightly away from the traffic lanes near intersections. This reduces the likelihood that peds will stand in the bike lane while waiting to cross the street and gives them good visibility to cars. The rest of the bike lane is separated from the ped space by a planted area. Sure, it is not 100% foolproof and you’ll probably have to slow down a bit approaching intersections. This is kind of just the nature of a busy city. Asking that you slow down a bit while going through intersections doesn’t seem unreasonable, it’s generally good for the safety of everyone, and it won’t slow you down too much. I will gladly take bikeways designed for 12mph, as you can always ride 20mph one block over on streets without bike lanes. Not to mention that this bike lane will be nice even in the summer, thanks to shade from the tree canopy above it. Great job on the rendering which looks awesome. Good to see that construction has gotten underway on this great landscape. Interesting news about the state of construction in NYC. McGraw Hill is another great source for all new york construction related news and updates. I’ve been away so I don’t expect many to read this but J, you don’t think peds will loiter between those tables and the curb leading to the crosswalk that exits to the left of the image above?!?! It’s simply not in a cyclists nature or self-interests to slow down unless its absolutely critical (the Dutch realize this with their design guidelines). This is why so many blow stops signs. Admittedly, I only looked at what was posted here and the on-line presentation about the facility so I don’t know all the details. I also don’t know if this cycletrack is to serve as a major connector for longer distance travelers which would likely increase the speed of those likely to use it. Even without these details I still have concerns from what I’ve seen presented in this blog posting. I eagerly look forward to seeing the project once its complete so I can study it further.